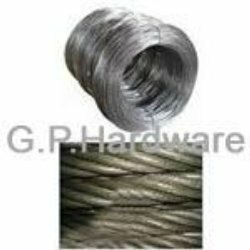 We are engaged in manufacturing a comprehensive assortment of Welding Wiremesh that find application in various industries. These wires are disgned and fabricated by our efficient team of professionals, who ensure their long service life. They are made using superior quality material procured from reliable vendors. Our excellent range of MS Wire & GI Wire can be obtained in several dimensions and sizes. With the in depth experience, we are engaged in distributing and supplying of Pipe fitting, PVC pipes and fittings, G.I. pipes and fittings, Stainless steel pipes and fittings, Hardware tools, M.S. pipes, pipe threads and fittings and ropes. In addition to these, we also have in stock Industrial filters, Belts and rubber products, Brass valves and fittings, Water meter, FRP roofing sheet and lifting equipment. Available in various sizes and specifications, these are procured from trusted vendors. Moreover, to meet specific requirements of our clients, we also provide customized solutions. We are looking for inquiries from South India region including Andhra Pradesh, Karnataka, Kerala and Tamil Nadu and cities like Bangalore, Chennai and Hyderabad. Owing to our capacious warehousing facilities, we are able to safely store the procured products. Furthermore, backed by expert quality controllers our company is capable of providing quality approved product range of Industrial Hardware. Besides this, through offering products competitive prices and adhering to on time delivery schedule, we have developed healthy business relationship with our variegated clients.